Starring Martin Gabel, Olive Sturgess, Richard Chamberlain. Written by Donald S. Sanford, From the Novel by Dolores Hitchens. PE: That’s it. I’m done. The naysayers were right. They said I’d never make it through all 67 episodes and they were right. This gig doesn’t pay enough for me to sit through this garbage. I have a family, a job, my social standing, hell, my mental health to worry about. Find another patsy, Scoleri. 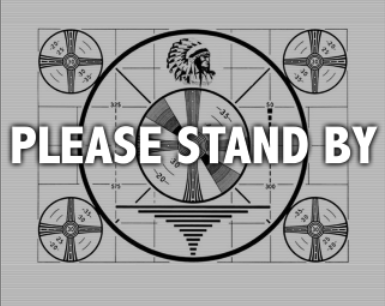 Sorry for the technical difficulties, folks. We had to review some contractual fine print before we continued with our assessment of "The Watcher." Lonely schoolteacher Mr. Frietag (Gabel) watches his neighbors as they come and go from the comfort of his rented room. Little do the townspeople know that kindly Mr. Frietag also happens to be a homicidal maniac who spouts Milton's Paradise Lost and murders sexually precocious teens. PE: All right, I'm okay now. I just needed to get that off my chest. I'm a professional. After all, I made it all the way through Indiana Jones and The Kingdom of the Crystal Skull. What's another one hour Larry Buchanan-esque Thriller, right? Actually, "The Watcher" is very much in the so-bad-it's-bad camp that Buchanan and other Grade-Z directors inhabited back in the 60s and 70s. The junk that Robert Rodriguez and Quentin Tarantino try their hardest to emulate for Grindhouse and Machete came natural to these guys. The amazing thing to me is that if you look at John Brahm's resume, it includes 15 episodes of Naked City, 12 Thrillers, 15 Hitchcocks, 12 Twilight Zones, 2 Outer Limits and 14 Man and Girl From U.N.C.L.E.s. A genre fan's auteur. What happened with "The Watcher"? JS: While I hate to interrupt your tirade to defend this particular episode (and rest assured it's coming folks — sooner or later Peter and I are going to clash when it comes to doling out the Karloffs), I think you'll recognize in retrospect that this one has got more going for it than some of the others we've seen. But please, continue. PE: Let's start with a terrible script saturated with laughable dialogue and nonsensical turns of event. The drama opens very atmospherically (I was reminded of Francis Ford Coppola's horror gem, Dementia 13) with the drowning of Suzie Tomlinson by the crazed Frietag. How did Suzie get in the water? How did this nutty perv lure this pretty young girl to her death? With candy? Movie tickets? We don't know because we're entering the middle of the story. In fact, the first time I saw this, I assumed we were seeing a "preview" (much like the opening of "Child's Play") of some of the dastardly events awaiting us. JS: You've left out the biggest question from the opening - just how is it that this violent murder, which leaves the killers hands bloody after wringing the poor girl's neck, gets signed off as an accident? Do you suppose the M.E. who examined Mrs. Goodfield in "Rose's Last Summer" was on the job again? PE: Frietag peers from his window and peeps into others' windows, muttering "Oh corrupt and faithless seed, how long shall I endure thy iniquity?" while Richard Chamberlain doffs his clothes. Yes, that Richard Chamberlain, at the start of his career. Less than a year later he would be the star of the hit TV series, Dr. Kildare (and a long way from The Thorn Birds. -JS). Frietag quotes from Les Miserables while "comforting" Suzie's sister, Vida (Gloria Clark). This all makes sense because Frietag is a teacher (I assume an English teacher), but what is making him kill? We don't know and we never find out. (My wife, ever the trooper for not yet bailing on a single episode, was particularly troubled this time around by the lack of motive. -JS). He types and mails a message to the cops (ala Zodiac years later): "IS THERE ANOTHER CORRUPTER ABROAD? I MUST BE SURE BEFORE I KILL AGAIN.." Is he a messenger from God put on Earth to punish the youngsters of the 1960s for their debauchery, or just the victim of a TV writer under a deadline? JS: Wait - gimme a second, I know this one... agh, I give up. To be fair, they did go to the trouble to give him a "Home Sweet Home" sign in his apartment, the sure sign of a serial killer. My favorite bit is when he looks right into the camera (watch for the shadow of the guy moving the cue cards) to read: "Great grief is a divine and terrible radiance which transfigures the wretched." Um, excuse me? Nobody said I'd have to have a Masters in English to follow the show. I do love how Peter casually identifies the quote as from Les Miserables. I guess that's what I get for teaching him how to use Google. PE: As with most of the bad episodes we've had to sit through, there are a few moments to keep you smiling. When Frietag interrogates Larry Carter (Chamberlain), he looks deep into the boy's eyes, touches him on the arm and says "I'd really like to help you... an older man can sometimes keep a boy straight." And yeah, there is that opening scene. JS: How about the aunt's line, referring to Carter and Beth (misidentified as Bess in the IMDB), "If it didn't go contrary to my Christian beliefs, I'd wish them both dead." Yikes! From all the episodes we've seen, I'd have to say Beth (Olive Sturgess - who would later appear in The Raven) gets my vote for the A Thriller A Day Babe of the Week. 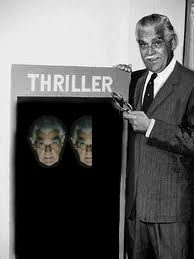 That alone should be worth one Karloff. PE: Watch for Frietag's death scene. Beth smacks him in the head with a water pitcher and Frietag falls out the window on the other side of the room to his death. JS: If you look closely, I think there was originally more to the scene than what we got. Observe how after Frietag tosses Beth aside, he's clearly moving in on Carter, yet the next shot cuts back to him grappling with her. This shot is the last we see of Carter, and I'm guessing there was a little bedside tussle before Beth does him away with the chamber pot. PE: I spent a lot of time trying to figure out if this was a camp classic or just another really bad Thrillah. I'm opting for the latter until someone sways me. Anyone? Why over-analyze? 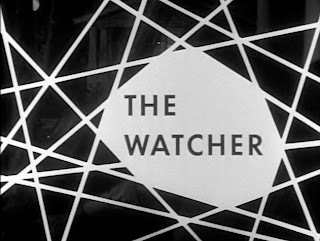 "The Watcher" is what it is: a dark, unpleasant melodrama thrown together in a couple of weeks. The Homicidal-maniac-on-the-loose thing was gaining traction at this time in film and (occasionally TV), so Thriller stepped into it big time with this over-the-top show, produced by Thriller's saviour-to-be, William Frye. I liked the moody, threatening shots of Martin Gabel peering through the delicate lacy curtains, and that cool shot about 6 minutes in where he goes out into the night, hears the aunt across the street singing a hymn to a harmonium accompaniment, walks off into the blackness, but then is briefly illuminated by a flash of lightning. Nice touch. Beyond that, it's pretty routine stuff. Martin Gabel, however, was a fine, legit stage actor with one of the greatest, most mellifluous speaking voices ever heard (he did lots of radio and narration work). He's very creepy in this, but grabs your attention every time he opens his mouth. But the young lover's plight, the socialite mother, the unecessary boozy uncle ("hey, lets throw in a part for Stu Erwin!...") who has the show's best line (".....or I'll tan your bottom!") to Olive Sturgess, etc etc...all of this is indicative of a show that was struggling to free itself of the Fletcher Markle crime/noir thing that, in it's attempt to be hard-hitting and cutting-edge, fell into the trap of lurid, heavy-handed drudgery with this one....despite a lot of cool, stylish touches and a solid performance by Gabel. (The garage/car-lift attempted crushing of Richard Chamberlain was another example of this episode's high violence content; normally, we'd expect our hero to recover quickly and save his distressed damsel; here, he's incapacitated for the rest of the show, with no clear indication that he'll ever be the same). I liked the brief scene with the (sister?) of the first murder victim, played by Irene Hervey and Alan Baxter (the cop); standard stuff, but she was very sympathetic and believable. Also, Three Stooges fans might recognize Claire Carleton, who plays Richard Chamberlain's (over-the-top) flighty aunt, as Chopper Kane's girlfriend in Shemp's 1947 "Fright Night". Again, I liked Rugolo's score for this one, which utilized a string quartet prominently (often playing the "Thirller" motif), with piano, Novachord....and an unfortunate solo trombone that farted around every time Martin Gabel started his sicko-psycho routine. After reading reviews here by Aycorn, Peter Farris, and Larry Rapchak, John and I have decided to take the next 59 days off and turn the reins over to these guys! Great work. A very enjoyable comedy but not a thriller. I thought this one was fine. I mean, really... it was 1960, for cryin' out loud. I thought there were some nice dark, unsettling moments. I got enough motivation from the killer -- the guy doesn't like corruption, and I guess that means kids running 'round together and getting into some lovin'. mom, who would *not* approve. Has anyone else noticed that the episode promos on the DVD seem to contain bits that are not in the actual episodes? In this one, after the killer conks Richard C. over the head, he says a line that I could not make out and would swear was cut from the episode. I also noticed this in the promo for one of the earlier episodes (was it "Worse Than Murder"?) where the promo included a flashback scene with the murder of someone who was only referred to in the past tense in the episode. I think this episode is unusual as the mad killer obviously has homosexual intimations for the Richard Chamberlain character. It's pretty blatant for 1960. I totally agree Greg. I'm glad I'm not the only one that saw that. The Deputy Sheriff also makes a point about Freitag being the sort of individual who projects his own corruption onto other behaviour. He's not murdering from the moral impulse he pretends, he's bumping off rivals for RC's affection. THANK YOU Greg Goodsell!!!! It was so obvious to me! Mr. Frietag is obviously obsessed with Larry (Chamberlain). And let's face it, who wouldn't be?? Chamberlain is luminescent in this episode! All the quibbling about lack of motive by the main bloggers here was perplexing. The motive was so obvious to me (I'm gay though, so I have a stronger sense of these things I guess). Mr. Frietag resents the cute young gals who get to be with hot Larry so he offs them. I thought this was okay. Probably my second favorite so far after "The Purple Room". Since when does a serial killer need a motive? They're insane. Not knowing the motive makes the serial killer creepier. It's more random. But there is a subtext of Christianity gone awry which I think is effective. This was by far a darker episode than most we've seen so far. I wish there would have been a payoff with either Chamberlain or the girl getting killed that would have been more gritty but I guess the censors were still pretty rigorously controlling TV. I did think we should have seen the killer fly out the window. That was a pretty awkward shot. The whole debutante thing is getting pretty old but I did like the implication of homosexuality as well as the implication of promiscuity when we see Chamberlain take off his shirt in shadow. The killer's eyes bugging out when the horn was blaring was pretty good too. Maybe my expectations have been lowered by the awfulness of the first six episodes, but this was closer to what I was expecting from "crime" episodes of Thriller, especially with the last shot of the hysterical girl with no nice and neat wrap up. I think everybody is a bit harsh on this one. I actually was impressed by Olive Sturgess's performance in the last act of the show. She displayed a defiant grit to all the authority figures condemning her love for Chamberlain, and to Martin Gabel in the final scene, that was a pleasant surprise. I liked THE WATCHER. Certainly as good as THE TWISTED IMAGE. Certainly not as good as THE PURPLE ROOM. It's a nice creepy stalker episode with Martin Gabel quite convincing as the over-the-top obsessed freak. He reminds me of a cross between Joe Pesci and Peter Lorre. Gabel has that gangster look along with those uncomfortable long gazes before he kills. Makes me wonder who would win in a stare down contest... Martin Gabel or Natalie Trundy from THE TWISTED IMAGE. The mother to daughter lecture scene in the "Leave it to Beaveresque" setting is hilariously bad. Gabel's auto attack on Olive Sturges is quite good and suspenseful. No one has commented on that rather cool scene. 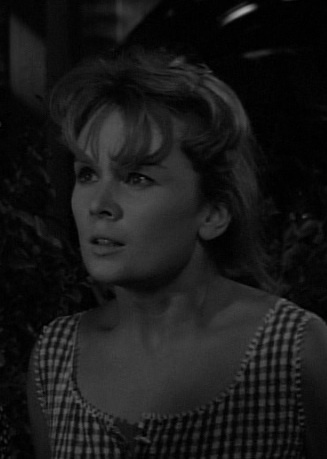 Reminscent of something Hitchcock would attempt (no, I am not comparing this episode with Hitchcock's work). While we did know all along who the killer was, the suspense factor was knowing what the principal actors did not know and their interactions with this creep. "2 Karloffs" for this one. Overall, it was entertaining. I had a hard time with the casting of Martin Gabel. He's fixed in my mind as the erudite, sophisticated husband of the glamorous and equally sophisticated Arlene Francis - trading bons mots on "What's My Line?". He did play at least one other sleazoid, though - the mob boss in "Lady In Cement", but he just doesn't work for me as a pervert. Whew! This was a wacky one. Yes, there is plenty of camp, but overall this episode plays straight and serious, and succeeds in doing so. The show starts off with a not very believable depiction of the murder of a young town beauty who didn't conform to the chaste codes of religious wingnut Martin Gabel. Martin plays his part as a creepy Peter Lorre type. What's creepy about his character is how he manipulates typical parent-teen generational gap friction to get on the parent's side without any sort of character screening. This episode's critique of christian piety was obvious to this viewer, but I wonder how many people were aware of it when the show first aired. I've read plenty of how heavy handed the nation's morality keepers were back then and would be surprised if they thought that this was an unwarranted attack on connecting christian dots with serial killers. Olive Sturgess is a fine piece of 1960 eye candy. Her character has a nice bit of post Rebel Without a Cause individualism. Hell, the showdown with her mother, where mom calls her out as a "Tramp!" just about had me rolling on the floor. Richard Chamberlain does a good job of playing a stock 60s beach teen. The scene where Gabel visits Chamberlain at the boat house to try to talk him into being a good young lad is very well played between the two actors, not to mention the creepy undertone of the older sexual predator in for the kill. "I'd really like to help you... an older man can sometimes keep a boy straight." The other actors and actresses in this episode are just ok, but that is fine because Gabel, Chamberlain and Sturgess more than command your attention. As soon as Larry and Beth go out to the beach we known Larry will somehow get separated from Beth and creepy Frietag will immediately attempt to close the gap. It happens, but surprisingly, it's not the climatic scene. Oh, it's also a great scene. My heart was really pumping when Beth was hitting the car horn. Following that, we get a coincidental meeting of Larry and Frietag that only a screenwriter could come up with. 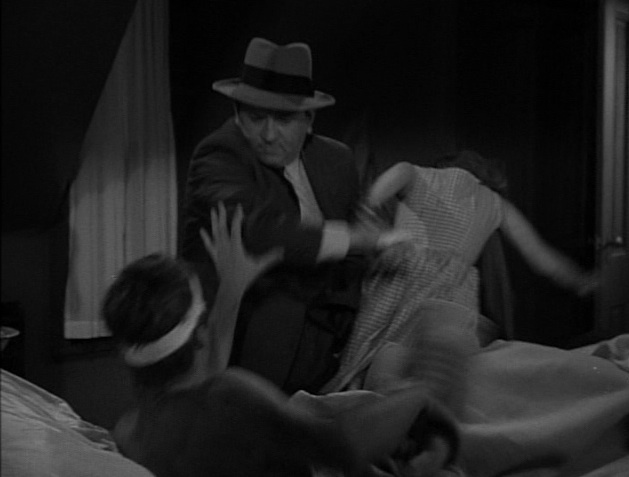 It's also a somewhat violent scene for 1960 television. After that it's one more convenient act to get the three main characters together for the final showdown. All ends well for our two young lovers as Frietag falls to his death. I wonder how the town women reacted when told of Frietag's misdeeds? I give The Watcher 2 Karloffs. I liked a lot of this episode, and I thought the motivation in the serial killer's repressed homosexual urges was pretty obvious. They make a point of saying that the murder victim at the start was another of Peter's friends (which seems an absurd phrase to use in describing this one). I was rather embarrassed for Irene Hervey, who had a dreadfully written stock villainous mom to play, but it was nice to see how professional and competent Stu Erwin was by comparison. BTW, Gabel was also a Broadway producer who notoriously turned down the chance to put on "Everybody Comes to Ricks" because the playwrights wouldn't make the extensive re-writes the script required. In a sense he was right, as the Warner Bros. writing team had to do some pretty major surgery on the script to turn it into "Casablanca." Just watched this, right after the superb Purple Room. Does anyone know why Claire Carleton's voice was dubbed, as it so clearly is? I watched this one pretty early in the series because one of the commentators said it was one of the best crime episodes. Turns out he was right- not that that's a recommendation. Its about 2 Karloffs, #32 on my list of 67. Martin Gabel's good, but he's not in it enough, what a terrible ending. I'd say of the 20 or so episodes that are really poor- only about 3 or 4 are horror episodes- A Wig for Miss Devore, Dark Legacy and Flowers of Evil come to mind. Has anyone read the source novel? I'm guessing that the homosexual subtext is far more explicit there. Watching Gabel and Chamberlain tiptoe around it in their boathouse scene is fascinating and, IMO, genuinely creepy and camp at the same time. 2.5/4. Not bad. A young Richard Chamberlain is good. Great portayl by the psychotic "Watcher". Mr. Arlene Francis, excuse me, I mean Martin Gabel does a nice job as the psycho in this episode, although I have to wonder if he could have set Richard Chamberlain 'straight' (given that Chamberlain, in real life, came out of the closet years later). I was a little puzzled by the dead girl's sister--is it just me, or wouldn't it have been more appropriate to have her as the dead girl's MOTHER, given that she looks significantly older? No matter, I enjoyed this one. Well, I admit that the writing of The Watcher is pretty awful, but Martin Gabel sells it for me. I have no idea as to whether he was a great or even very good actor but he was well cast in this entry and pulled it off for me. The rest was second rate melodrama at best, but the lurking, outwardly respectable Gabel, while no Laird Cregar, created a truly frightening character. Otherwise, there's not much else to recommend the ep. The plot unfolds,--if that's the right word for it--at an almost too leisurely pace; and the dazzlingly handsome Richard Chamberlin, who ought to have become the hero, was (stupidly) taken out. Most of the rest of the cast was adequate, no more. The production values were okay but below the level of what Thriller would soon achieve a few more episodes down the line. It's almost like an early, ginger attempt to produce a real Thriller (of the Frye-Sanford-Benton kind) before the series kicked into high gear. Motive would be jealousy. Frietag practically stated he had a crush on Larry while he was fixing up a boat. It's probably the same reason why he killed Suzan, because it was competition. Why didn't Frietag kill the girl right away after taking off the horn of the car????? I agree with Larry. Crank 'em out under the oppressive and write or perish system. What makes this episode so repulsive is that the killer Frietag is infected with the sodomite perversion. That is, not only is Freitag a murderer, but he's a sodomite pervert to boot. This double depravity makes this episode almost unbearable to endure.